One Two Three Four Cake recipe or 1 2 3 4 cake was popular in the 1950s. It's an old fashioned classic recipe found in most old cookbooks. I saw it in an old book published 1891. There is a reason this cake has survived for such a long time. It has a fine grain, velvet like texture due to the mixing method and is moist and delicious with a yummy butter taste. The original recipe called for 1 pound each of butter, sugar, eggs and flour. I have divided the recipe in half to make only one loaf. You can also bake this as a layer cake. Pan sizes are listed below. Sift together flour, baking powder, and salt twice. Set aside. I sift my flour onto a piece of waxed paper to save washing an extra bowl. Beat egg whites in a mixing bowl on high speed until soft peaks form; gradually add one half of the sugar and continue mixing until all sugar is incorporated and soft peaks are higher. In another mixing bowl cream butter. Gradually add rest of sugar and cream until light and fluffy. Stir in vanilla, butter and nut flavoring and vanilla extract. On medium speed mix in flour and milk alternately, starting and ending with flour. Use a light hand here so you do not over beat the flour. 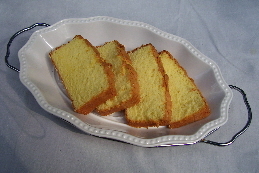 This is a technique that produces a light, tender cake. Gently fold in beaten egg whites and mix on medium speed just until whites and yellow batter are thoroughly mixed. Takes about 30 seconds. Do Not Over Beat! Pour batter into a 9" x 5" prepared (bottom lined with waxed or parchment paper, greased and floured) loaf pan. Bake in a preheated oven 325F. for 40-45 minutes until lightly browned and sides are pulling away from the pan. To test further for done, stick a toothpick into center of cake. It should be clean when removed with no gooey cake sticking to it. This One Two Three Four Cake needs no frosting except for decorations. Serve it hot right out of the oven or cool and frost with your favorite frosting or icing, if you prefer. Double this recipe to make two loafs or one tube cake. Eat one loaf now and freeze the second one for later. You can also double the recipe, then divide the batter and add different flavors to each of the batters. Viola, you have two different cakes without all the extra measuring and mixing. For layer cakes bake in three 8" round, two 8"square or two 9" round cake pans for 30-35 minutes. Make a scrumptious Strawberry Shortcake by covering the individual slices with fresh or frozen, sliced or whole strawberries and top with Homemade Whipped Cream or Greek yogurt. Substitute bananas for the strawberries, and top with yummy Hot Chocolate Sauce and the Homemade Whipped Cream for another quick desert. The possibilities are endless with this basic, classic cake and the variations listed below. Add your own creation, too. 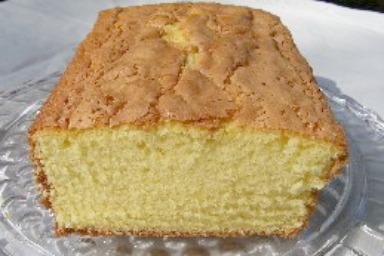 This is the best yellow cake I have ever tasted.